Clockwise from top left: the UNSC responds to a Covenant invasion of a UEG colony world; a Covenant fleet glasses Kholo; the UNSC, Covenant and the Flood battle on Installation 04; the war's final battle at the Ark; the Battle of Earth; and the Pillar of Autumn fleeing from the Fall of Reach. Devastation of the Sangheili colony, Joyous Exultation. Destruction of the Covenant battle station Unyielding Hierophant. "Your destruction is the will of the Gods... and we are their instrument." — The Covenant's declaration of war. The Human-Covenant War, also known as the Covenant War,[notes 4] the Human-Covenant Conflict, and the Great War, was a major interstellar conflict pitting humanity and its United Nations Space Command against the Covenant during the mid-26th century between February 11, 2525 and December 11, 2552. There were two additional factions sporadically involved in the conflict: the Flood and a small number of surviving Forerunner constructs. Both factions proved to be invaluable to the efforts of humanity, as the information taken from Forerunner constructs and the Flood invasion of High Charity were helpful in splitting the Covenant apart in November 2552. The war was instigated by the High Prophets of the Covenant following a discovery which led them to believe that humans were directly related to the Forerunners, contradicting their ancient religion. Seeking to keep various political and religious orders intact, the High Prophets declared a holy war of genocide against the human species, and the discovery of their relation to the Forerunners was kept a secret. With superior firepower, numbers and technology, the Covenant would repeatedly overpower the UNSC across hundreds of human-inhabited worlds, including the heavily defended strongholds of Reach and Earth. Humanity would win only scattered and costly victories. The conflict was also the cause of the Great Schism within the Covenant. Forced to fight a war on two fronts, the formerly monolithic empire was torn apart. While the deciding battle of the war was fought on December 11, 2552, a formal ceasefire was not agreed upon until February 2553. The official cessation of hostilities was declared on March 3, 2553. The war was incredibly costly to both sides, with over twenty-three billion humans and billions of Covenant individuals killed during the hostilities. An outbreak of the virulent parasite known as the Flood almost consumed both factions near the war's end. The conflict lasted for a total of twenty-eight years. After the ceasefire was declared, the Great Schism continued in the form of wars between the Sangheili and the Jiralhanae until at least 2559. Concurrent to this, the Sangheili species fell into civil war, as did the Jiralhanae, while the UNSC itself had to deal with a resurgence in the Insurrection. In the wake of the Covenant's cessation, its former member species fragmented into many splinter factions. Among the most notable of these groups was the religiously devout new Covenant formed in the disarray following the war by Shipmaster Jul 'Mdama. The UNSC was still locked in conflict with this faction, along with several other splinter groups in, until late 2558. Staff Sergeant Johnson leading Colonial Militia during the Covenant invasion of Harvest. Humanity and the Covenant first came into direct contact on February 3, 2525, when a Kig-Yar missionary ship, the Minor Transgression, discovered a human ship transitioning out of slipspace and subsequently raided the vessel. The raid continued to another unfortunate human ship. Some time after, Sif, Harvest shipping operations AI, investigated the raids and reported her findings to an undercover Office of Naval Intelligence agent, Jilan al-Cygni, believing that the attacks were Insurrectionist activity. The ONI agent devised a trap for the raiding parties, which resulted in a minor skirmish between Staff Sergeants Nolan Byrne and Avery Johnson, and the Kig-Yar privateers. When the Covenant returned with another ship and a contingent of Jiralhanae and Yanme'e, the UNSC proposed a meeting (via pictogram) with the intention to make amends and to trade with the alien species. The Covenant met the UNSC on Harvest, but were only interested in claiming the relics that the Luminary had detected on Harvest, completely oblivious that the humans were the "relics" in question. The meeting was botched after Osmo, a member of the Colonial Militia, was attacked by a nervous Unggoy who was part of a second Covenant force sent to look for the relics. As a result, a firefight erupted between the two groups and the Covenant promptly retreated back to their ship. The political ramifications of these relics were abundant, and two San'Shyuum bureaucrats, the Minister of Fortitude and the Vice Minister of Tranquility, were already scheming to use the supposed reliquary to inaugurate a new Age of Reclamation with themselves as the Hierarchs of the High Council. To do this, they needed the blessing of the Oracle of High Charity. When the two San'Shyuum approached the Philologist to affirm on their behalf, the data from the Rapid Conversion caused the long-dormant Oracle to reactivate. Mendicant declared that the Covenant had been misinterpreting Forerunner symbols: the "relics" in question were the humans, calling them Reclaimers and his makers. This shocked the three San'Shyuum, who falsely concluded that the humans were actually living Forerunners who had been left behind when the others transcended. Although they were able to prevent Mendicant from taking the Forerunner Dreadnought to take the humans to deliver them to the Ark, Fortitude concluded that if the masses learned that they might be left behind, they would rebel against the Prophets. Fortitude and Tranquility inducted the Philologist into their plan and ascended as the High Prophets of Truth, Regret, and Mercy. Intending to keep the revelation about the humans a secret and prevent the Covenant from falling apart, the hierarchy declared that the humans destroyed the holy reliquary on Harvest, and ordered the entire race to be eradicated. The first battle of the war was the extended, albeit one-sided, engagement which took place on Harvest. The UNSC managed to delay the Covenant long enough to evacuate many of Harvest's civilians. Eventually, the Covenant ship responsible for the attack glassed the planet's surface. Cole's fleet destroys the Covenant ship in the Second Battle of Harvest. From that point on, the Covenant continued to attack and destroy the humans wherever they were found, using their Luminaries to find human worlds. Though the UNSC forces fought bravely, their inferior technology and numbers meant that even a close victory was far from guaranteed. The Covenant, fighting a war of extermination, did not need to commit to full ground invasions except in special circumstances; their ships simply needed to destroy space-borne defenses and any other threats around the planet. They would then reduce the planet's surface to glass with orbital plasma bombardment. In general, human missiles and magnetic acceleration weapons were asymmetrically matched with Covenant energy shields and plasma weaponry. The few major victories achieved by the UNSC were usually due to tactical genius, extensive use of nuclear weapons, the rapid deployment of Spartan teams, or decisive ground engagements, where UNSC technology and skill usually outmatched Covenant tactics. After just six years of combat, space battles with the Covenant had depleted the UNSC's nuclear stockpile to almost nothing in some sectors of space. For twenty-seven years, the Covenant whittled down the UNSC planet by planet. Despite this, the UNSC kept the war secret to the public in the first few months of engagement. Realizing the threat posed to humanity by the Covenant, the UNSC Colonial Military Administration gave Vice Admiral Preston Cole the command of the then-largest fleet in human history with orders to retake Harvest. Cole retook Harvest in 2526, and then spent five years chasing the Covenant around the Outer Colonies, fighting them and scoring victories at Alpha Aurigae, XI Boötis A, and Groombridge-1830. Meanwhile, the Covenant returned to Harvest, determined to recapture the planet. This led to a five-year long series of engagements on Harvest between the Covenant and the UNSC. Because of the threat the Covenant posed, the UNSC began deploying the SPARTAN-IIs, super soldiers originally trained to fight the Insurrection. The Spartans became one of humanity's greatest — and most celebrated — defenders, demonstrating a remarkable ability to turn the tide of battle. Their prowess was not lost on the Covenant, who came to fear the Spartans as "demons". The Prophet of Regret converses with Arbiter Ripa 'Moramee on the destruction of the human race. Despite their major numerical and technological advantages over humanity, by 2531, the Covenant High Prophets had realized that the task of destroying an entire sapient species had a logistical burden beyond anything that the Covenant military could muster without leaving Covenant space defenseless. In spite of the UNSC's inferiority in comparison to the Covenant, the Prophets apparently considered their armed forces to be powerful enough to pose a threat to the Covenant proper. Seeking a more efficient solution, the Prophet of Regret dispatched an Arbiter to Harvest to claim a Forerunner artifact buried under the north pole of Harvest. Preston Cole counterattacked by leading a fleet composed of the UNSC Spirit of Fire and the UNSC Prophecy back to Harvest after receiving a message from an ONI prowler. The battle was a victory, despite major casualties. Upon discovering that the Covenant, under the command of 'Moramee, had excavated Forerunner artifacts in the northern polar region, Captain James Cutter deployed ground forces to remove the Covenant occupation. After a heated fight on the surface, the UNSC forces were able to examine the artifact, a star map, and realized the information within had led the Covenant to another human colony: Arcadia. The UNSC Spirit of Fire engages the CPV-class heavy destroyer Proclamation's Tithe in the Etran Harborage. As predicted, the Covenant followed the information from the artifact to Arcadia. The Covenant hoped that the planet would contain more Forerunner artifacts for them to claim, and while they only found a complex of ruins, information garnered from them led them to a Shield World. The Spirit of Fire followed and removed the Covenant presence from the planet. However, 'Moramee's capture of an important civilian researcher forced Captain Cutter to pursue the Covenant to the newly discovered Shield World without reinforcements. On the Shield World, the crew of the Spirit of Fire eventually discovered that the Covenant needed Professor Anders to activate the Apex and claim the huge fleet of Forerunner dreadnoughts held there. 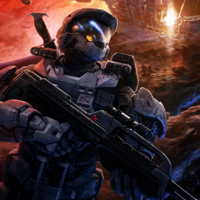 A group of Marines, together with SPARTAN-II Red Team, rescued the researcher and destroyed the Shield World by initiating the collapse of the interior star. The Arbiter was also killed by John Forge during the battle though the Prophet of Regret escaped. Despite the well-publicized victory at Harvest, the UNSC was already on the way to losing the war. A number of colonies had already been glassed by the Covenant or abandoned, including Eridanus II, Dwarka, Bliss, Madrigal, Asmara and Biko. The UNSC's sole hope apparently lay with the SPARTAN-II Program. However, there were never enough Spartans to decisively turn the tide of the war in favor of humanity. Recognizing this, the Office of Naval Intelligence authorized the creation of the SPARTAN-III Program. The brainchild of Colonel James Ackerson, these Spartans would be trained with a greater emphasis on stealth and teamwork, and would be sent on missions against high-priority targets that would be impossible even for elite units. A member of Gray Team at the Battle of the Rubble. With the majority of the Outer Colonies glassed or abandoned, the UNSC faced an economic crisis, as many of their agriculture worlds had been destroyed, leading to food shortages. On Charybdis IX, food riots were common. Meanwhile, Covenant forces began to encroach on the Inner Colonies. In response, the UNSC issued United Nations Space Command Emergency Priority Order 098831A-1, otherwise known as the "Cole Protocol". It stated that no UNSC vessel may lead the Covenant to Earth or any other human population center. Furthermore, all movement through space was restricted to UNSC Navy vessels. Insurrectionist attacks increased in the face of what the colonies perceived as a removal of their right to freedom of movement. This was to culminate in the discovery of Insurrectionists using Covenant weapons supplied by apparently renegade Kig-Yar. Shocked, the UNSC viewed this as a major threat to security. Upon learning of this, the Prophet of Regret declared such weapons as heresy, and as a result dispatched Thel 'Vadamee to destroy the source of the modified weapons: a remote asteroid habitat known as the Rubble. Fleeing from the Battle of Charybdis IX, the UNSC Midsummer Night chased an Insurrectionist freighter to the Rubble and discovered that the Insurrectionists there had actually formed an alliance with a group of Kig-Yar. The Jackals were supplying the weapons and the Insurrectionists were modifying them. The crew of the Midsummer Night, including its captain, Lieutenant Jacob Keyes, were captured, but later escaped and helped SPARTAN-II Gray Team and the Rubble's citizens stop an assault from the Kig-Yar leader, Reth, and 'Vadamee's forces. They managed to rescue a million civilians from behind enemy lines and escorted them to Falaknuma. It later transpired that the Prophet of Truth had ordered the Kig-Yar to ally with the humans so that they could discover the location of Earth from stolen navigation data or through tracking devices in the weapons. Through this, the Covenant found two more worlds to attack. By the time of the Battle of Jericho VII in 2535, most of the Outer Colonies were either destroyed, or cut communications with the UNSC proper. Humanity, heavily out-gunned, lost much ground to the Covenant. For fifteen years, the war ground on in a predictable pattern; costly victories on the ground for UNSC forces, with near total Covenant space superiority. The UNSC managed to deal a heavy blow to the Covenant in 2537 with the destruction of the Covenant manufacturing plant K7-49 in Operation: PROMETHEUS, and again during the Siege of the Atlas Moons in the same year. However, these victories were offset by the loss of New Constantinople, the loss of its colonies at Leonis Minoris, and the total destruction of the force of SPARTAN-IIIs sent to destroy the Covenant base. Throughout the 2540s, the UNSC was dealt ever greater blows with the death of the SPARTAN-II Sheila-065 during the Battle of Miridem in 2544, followed by the defeat at Actium in 2545, defeat during the Fall of Arcadia and the loss of Paris IV in 2549. One of the UNSC's success was Operation: TORPEDO in 2545. The loss of 298 SPARTAN-IIIs was ultimately considered acceptable losses by UNSC High Command. The SPARTAN-II raid on the Third Fleet of Glorious Consequence to recover a captive Dr. Halsey further proved the Covenant Empire was overwhelmingly powerful, but not invincible. Of the few major wins in the 2540's for the UNSC, and one of the most significant and strategically advantageous was the Battle of Psi Serpentis in 2543. This engagement became colloquially known as Admiral Cole's last stand due to the presumed death of Admiral Preston J. Cole. In addition to the alleged death of Cole, over 300 Covenant vessels, two fleets worth, were completely vaporized when UNSC nuclear missiles detonated inside the atmosphere of Viperidae, a supermassive gas giant. This detonation spurred spontaneous fusion at the core of Viperidae, temporarily turning the super gas giant into a brown dwarf star. Cole's achievements in this battle alone were only rivaled by the destruction of the Unyielding Hierophant and the actions of Spartan-117 throughout the course of the war. A painting depicting the battle, titled "Admiral Cole's Last Stand" was created and by 2552, it hung on the wall of the HIGHCOM Facility Bravo-6 on Sydney, Earth. Civilians on a human colony world under siege by a Covenant invasion force. While the Covenant had merely been slowed by the UNSC's military efforts, there was growing tension between the San'Shyuum and the Sangheili over the Human-Covenant War. At first, the Sangheili had followed the Prophets command to destroy the humans without question. But after more than twenty five years of war, humanity's continued and fierce resistance in the face of certain death had deeply impressed the martial Sangheili. There was a growing consensus among the Sangheili that the humans had earned the right to be offered membership in the Covenant, which the Prophets continued to reject. At the same time, the Jiralhanae, the one race which could challenge the Sangheili's dominance of the Covenant military, were rapidly earning favor with the Prophets, as they were less inclined to question orders. Towards the end of the war in 2552, the Office of Naval Intelligence was resigned to the fact that humanity may only have months left before the Covenant destroyed the remaining Inner Colonies and moved against Earth. To try and buy time, HIGHCOM ordered all available SPARTAN-IIs to return to Reach and commence Operation: RED FLAG, a mission to locate the Covenant homeworld and capture a Prophet to force the Covenant into a cease-fire. The last year of the war saw humanity's largest defeat since the war's beginning, but also saw several of their greatest victories, coupled with the destruction of the Covenant as a galactic power. On Sigma Octanus IV, the Covenant were defeated, though at the cost of not only heavy UNSC casualties but also the Covenant attaching a spy probe to the destroyer Iroquois leading the Covenant to Reach, which they attacked a few days later. On the ground, the SPARTAN-IIs secured a Forerunner artifact covered in symbols that the Covenant tried to transport out of Cote d'Azur. The Fall of Reach and Tribute that followed resulted in staggering losses for both sides, but in the end the Covenant claimed a costly victory. The Pillar of Autumn was among the surviving UNSC ships which fled the battle, and made a somewhat blind jump. The destination as described by Cortana was calculated with symbols from the Sigma Octanus IV artifact, coordinates to the Forerunner ring world of Halo. The Pillar of Autumn rushed to its destination, pursued by a dozen Covenant warships. The Pillar of Autumn pushes through the Covenant blockade and escapes Reach. The Covenant suffered a costly defeat on and around Installation 04. Here, the human survivors from the Halcyon-class cruiser, the Pillar of Autumn, managed to form an effective and surprising resistance to the Covenant. Unwilling to risk damaging the sacred ring, the Covenant was forced to fight the humans on Halo's surface rather than using their usual bombardment tactics. The Covenant found the UNSC very adept at fighting on the ring's surface, employing their firearms and vehicles in classic guerrilla raids. The Covenant was soundly defeated in numerous raids led by SPARTAN John-117, including an attack on a grounded cruiser, the Truth and Reconciliation, successfully escaping with the captain of the Pillar of Autumn, Captain Jacob Keyes. The battle on Halo then suddenly took a turn for the worst for both sides when the Covenant accidentally released an ancient and deadly parasitic race called the Flood. The Flood, having been imprisoned within Halo for many thousands of years, instinctively spread quickly throughout the ring, killing or assimilating every unsuspecting human and Covenant in their path and would become a third party in the war. During the course of the battle, John 117 discovered the true nature of Halo and proceeded to detonate the crashed Pillar of Autumn's engines, destroying the ring, and escaped, much to the Covenant's horrified dismay. The destruction of the holy Halo construct and the later loss of the flagship Ascendant Justice to the surviving UNSC forces led to Supreme Commander Thel 'Vadamee being disgraced and demoted before being branded with the Mark of Shame, leaving him dead in the eyes of the Sangheili. Only the intervention of the Prophet of Truth prevented 'Vadamee's certain execution. He was instead given the title of Arbiter and sent to quell a Heretic uprising that had taken root on the Forerunner gas mine over Threshold. The UNSC Home Fleet shortly before the Covenant attack on Earth. The Covenant discovered Earth as a result of an accident after the Pious Flea had been intercepted by the UNSC stealth ship Apocalypso. After retrieving a Forerunner artifact, the Apocalypso made a Slipspace jump directly to Earth. When the ship tumbled into real space and crashed on Luna, the Pious Flea sent a message to the heart of the Covenant military, containing reconnaissance data, photos, star maps, and the coordinates of the Forerunner artifact, which was now on Earth. This information was first relayed to the High Prophet of Truth, who, due to his personal socio-political machinations, kept it secret from his fellow Hierarchs. Instead, he began to amass a massive fleet of approximately 500 ships to the command-and-control station Unyielding Hierophant. The surviving humans from the battles of Installation 04 and Reach, however, discovered the fleet and the direct threat it posed to Earth. Using the captured Covenant flagship Ascendant Justice, the small group of soldiers lured the fleet into a trap and destroyed it. A few weeks after this defeat, the Prophet of Regret discovered the location of a significant Forerunner artifact on his own. Without knowledge of the fact the planet housing this artifact was the human homeworld, Regret led a small fleet of fifteen ships to Earth, in order to locate a portal to an installation known as "the Ark". Though hopelessly outgunned by the UNSC's new orbital defense grid of MAC guns, the Prophet of Regret's flagship managed to break through the human defenses to New Mombasa. The Covenant ground troops quickly spread through the city, destroying both military and civilian resistance, but a counter-attack by the Marines and John-117 resulted in their swift defeat. With his fleet burning in orbit, Regret was forced to retreat. His carrier jumped into slipspace from within the city, damaging it severely. Directly following Regret's jump, a reinforcement force sent by the Prophet of Truth arrived, resulting in a month-long constant engagement on Earth. Unfortunately for Regret, four human ships, the In Amber Clad among them, had followed them through their own slipspace rupture to Delta Halo. With the orders "Find out why he came to Earth; why he came here," John-117 was hard-dropped with a complement of ODSTs to Delta Halo's surface. Led by John-117, the humans forced their way through Regret's forces until they had reached the Prophet himself. At that moment, High Charity, having learned of Delta Halo, arrived and launched multiple waves of Phantom dropships to aid Regret. These forces were withdrawn by the Prophet of Truth as part of his plan to remove the Sangheili from power in the Covenant. However, Truth ultimately underestimated the full impact his 'reforms' would have on the Covenant's chances for military victory. The Master Chief assassinated Regret, dealing a heavy blow to the Covenant's political structure. The Prophet of Truth then gave the order to glass the temple in which Regret resided. John-117 narrowly survived only to be captured by the Gravemind, who had already formed a plan to prevent the Covenant from completing their Great Journey. Meanwhile, the majority of the human forces on In Amber Clad had traveled to Delta Halo's Library to obtain the Index, which is the key to firing Halo. Originally, the Covenant had been unaware of the Index's importance, but luckily for them, Arbiter Thel 'Vadamee had obtained 343 Guilty Spark, the monitor of Installation 04, while destroying the Heretic base. The monitor, known to the Covenant as an Oracle, told the Prophets of the Index and the Arbiter was sent to retrieve the "Sacred Icon". The mission was complicated though by the unexpected release of the Flood. Despite this, the Arbiter successfully reached the Library and prevented the humans from claiming the Index. Just as Miranda Keyes claimed the index, the Arbiter stole it from her, kidnapping her and Sgt. Johnson. However, the Index was stolen from the Arbiter by the Jiralhanae Chieftain Tartarus, who was under the Prophets' orders to retrieve the Index and kill the Arbiter, whom Tartarus knocked down an apparently bottomless shaft. With the Index secure, the Prophets then ordered the Jiralhanae to begin eradicating the Sangheili, thus starting the Great Schism. Ultimately this led to the death of Tartarus at the hands of 'Vadamee and Johnson and a temporary alliance between the Sangheili and the human forces. Delta Halo was prevented from firing by Miranda Keyes while the Flood infected and absorbed the Prophet of Mercy, leaving the Prophet of Truth firmly in control over the Covenant Empire. SPARTANs during the Onyx Conflict. Long before the events around Halo, the classified UNSC colony of Onyx had been designated the headquarters and training ground for the SPARTAN-III program. However, the UNSC had no idea that the planet was in fact a huge Forerunner structure, integral to the Halo Array, and composed of trillions of Sentinels. After John-117's destruction of Alpha Halo, the Sentinels were roused by the disruption of the Halo network and the portal leading into the Shield World at the planet's core began to close. At this time, a small group of SPARTAN-IIIs were training in a top honors exercise on the surface. After the humans failed to exchange the proper counter-responses, the Sentinels relabeled the Reclaimers as an "aboriginal subspecies" and began to exterminate them. Led by Kurt-051, the SPARTAN-IIIs fought a guerrilla war against the Sentinels until Doctor Catherine Halsey arrived on Onyx and explained the wider situation. Knowing that the Forerunner technology buried in Onyx's core could turn the tide of the war for humanity, Halsey used Forerunner technology to send a message to Fleet Admiral Sir Terrence Hood, requesting reinforcements. Hood deployed Blue Team to Onyx, who stole a Covenant destroyer to reach the planet in time. Meanwhile, the Sangheili forces under the leadership of Imperial Admiral Xytan 'Jar Wattinree deployed a fleet to Onyx to claim the "sacred relics" for their fight against the Jiralhanae. Xytan would not live to hear of the results of this mission, as he and the majority of his fleet were annihilated by a UNSC NOVA bomb recovered from Reach. After Blue Team made landfall, Fleet Master Voro Nar 'Mantakree's fleet arrived at Onyx, taking down hundreds of orbiting Sentinels before discovering the UNSC forces in the recently-uncovered Forerunner city below. 'Mantakree personally led the Covenant forces on the surface, before a UNSC battlegroup arrived and used tactical skill and indirect help from the Sentinels to destroy the majority of the Sangheili fleet before being wiped out by reinforcements from Joyous Exultation, with only one ship escaping. Underneath Onyx, the Spartans had discovered the core room antechamber and held off hundreds of Covenant troops before being forced to retreat into the shield world in the core. Kurt-051 sacrificed himself by detonating two FENRIS nuclear warheads, killing the entire Covenant force. After the core was sealed, Onyx broke up into trillions of Sentinels, guarding the construct. With their forces dangerously depleted, many of the warlike Sangheili subsequently allied with their former enemy, humanity, under the Arbiter's leadership. The Sangheili and humans make ready to finish Truth and the Covenant. "In memory of those fallen in the defense of Earth and her colonies - March 3, 2553"
Following the Flood infestation of High Charity, the High Prophet of Truth led his remaining fleet to Earth to complete what his occupation forces on Earth had started. Little did he realize that a SPARTAN-II had stowed away with him on board his Dreadnought. By the time Truth arrived at Earth, a full-scale battle in space and on the ground was under way between UNSC and Covenant fleets. After several weeks of combat, the UNSC Home Fleet was nearly wiped out. However, the attacking Covenant armada was also vastly reduced, and focused on securing an enormous unearthed Forerunner structure near the ruins of New Mombasa. With the arrival of John-117, the remaining UNSC forces launched an assault on the area, sweeping aside all Covenant resistance and finally launching an all-out attack on the Prophet of Truth's Forerunner Dreadnought. Unfortunately, even in-atmosphere MAC strikes proved ineffective against the ancient ship's hull, as Truth quickly activated the Portal and escaped. Events were further complicated by an unexpected attack by the Flood. Thanks to the timely arrival of the Sangheili, the Flood force was vanquished but not before Master Chief recovered a recording from Cortana, who had stayed behind on High Charity. Cortana's message told of a means to stop the Flood on the other end of the portal. The battle raging over Installation 00. The final battle of the war was fought in December 11, 2552. A small fleet of human and Sangheili forces was sent through the portal, leading them to the Ark, just outside the Milky Way. As they arrived, the Covenant fleet above the Ark immediately attacked. Though the joint human-Sangheili fleet was outnumbered 3-1, the battle ended in defeat for Truth's Jiralhanae fleet. At the same time, UNSC forces were deployed to the surface of the Ark in order to stop Truth, who was attempting to activate the Halo Array from the Ark's Citadel. Led by the Master Chief, the UNSC forces smashed through the remaining Covenant resistance on the ground. The battle was complicated by the arrival of High Charity. As the Flood began to spread, the Chief and the Arbiter went on to thwart Truth, who died in mid-Flood-infection at the Arbiter's hand with the Flood helping to reach him. John-117 deactivated the Halo Array, preserving all life within its firing pattern. With the Covenant forces completely shattered, Truth's death marked the effective end to the war. The Flood still remained a threat, but were eliminated by John-117, the Arbiter, Cortana and Sergeant Johnson by firing the isolated replacement Halo over the Ark itself, destroying Installation 08 and damaging Installation 00 severely. Although Forward Unto Dawn managed to reach the portal, the portal collapsed splitting the vessel in half. Trapped in the rear section of the frigate, John-117 placed himself into cryosleep until he could be retrieved, eventually drifting to the Forerunner shield world of Requiem. The UNSC's greatest soldier, and humanity's champion, was presumed dead. With humanity under threat of complete annihilation, ONI sent SPARTAN-II Gray Team on a mission deep behind enemy lines. The plan was that if Earth fell, Gray Team would retaliate against the Sangheili who led the naval fleets that destroyed human colonies by attacking a Sangheili world. During the Battle for Earth, Gray Team received a message stating Condition Endgame, meaning that the Covenant had appeared in the Sol system and the Cole Protocol had finally failed to protect the planet. Unable to reach Sanghelios as it was too well defended, Gray Team instead targeted the colony world of Glyke, home to billions of Sangheili. Though the war ended, Gray Team's ship had a damaged deep-space communications device and thus could not receive any orders to cease or withdraw. Confident that humanity was about to be destroyed, Gray Team took a vote and decided to carry out the mission, hoping that the slaughter would stop humanity's extinction. In December of 2552, just days after a tentative peace treaty was established with Thel 'Vadam and the Fleet of Retribution, Gray Team destroyed Glyke with a NOVA bomb. With their ship damaged by the blast, Gray Team was forced to evacuate aboard their lifeboat and was left adrift in Glyke's remains, asleep in cryo chambers. The ceremony held to honor the fallen. "Decades from now, when historians evaluate the war, what will they say about us? Will they claim that our victory was ultimately fruitless? That it failed to secure a lasting peace, or worse, that it was only a prelude to far greater horrors that now lay ahead? My hope -- OUR HOPE -- is that history would instead view this war as a catalyst. That the last thirty years were a crucible, a threshing floor for our species, sifting out our fears and frailties. And that ultimately it made us stronger and more vigilant in the end, fully prepared for whatever will come next. After all, what good is struggle if there is no change? What good is a fire if the sword is not made stronger?" — Codename: SURGEON prefacing the first Eleventh Hour report. On March 3, 2553, a monument was erected on a hillside near the Portal to the Ark to commemorate the billions of men and women killed during the war, and John-117's tag was included as he was presumed MIA by the UNSC, as no Spartan could be declared dead. Lord Hood shook hands with the Arbiter to signify an end to hostilities and a formal ceasefire was agreed upon between the UNSC and the Arbiter's Swords of Sanghelios. The Treaty of 2552 was eventually signed between humanity and the Swords of Sanghelios, officially ending the war for the two factions. As part of the treaty, neither faction was allowed to return to the remains of Installation 04 with a return being considered a severe violation of the peace. The Great Schism would continue for at least another six years between Sangheili and Jiralhanae factions, further depleting their now crumbling infrastructure. Their reliance upon the sciences and technology of the Forerunners, while neglecting their own, proved a weakness. The fate of the Prophets, after the infestation of High Charity resulted in the near-extinction of their race, now hangs in the balance, with little more than a thousand survivors able to flee to unknown space. The most destructive conflict in human history had ended in the survival of humanity, but at a staggering cost. Both the UNSC and the former members of the now-broken Covenant then turned to the enormous task of rebuilding their once great societies. After the war, Codename: SURGEON authored a series of reports detailing the impact of the Covenant War and the postwar status quo. In light of predicted resurgences of the Covenant and the Insurrection, as well as new discoveries regarding the Forerunners and their complex relationship with humanity, SURGEON hoped that future historians would view the war as an experience which served to strengthen the resolve of humanity as a whole and prepared them for even worse struggles yet to come. This view echoes SURGEON's own conclusions regarding the Insurrection's impact on humanity's survival in the Covenant War in Historical/Psychological Analysis of Cole, Preston J. The end of the war only provided a short period of calm for humanity and the former-Covenant species, before threats both new and old began to emerge. The end of the war had had a profound effect on Thel 'Vadam, whose human-sympathetic policies were ultimately a factor in the beginning of the Blooding Years and the rise of the Servants of the Abiding Truth. Shipmaster Jul 'Mdama eventually reunited some of the disparate factions which had surfaced in the wake of the Great Schism and formed a new Covenant faction with the goal of eradicating humanity. This faction was one of the most prominent players in the post-Covenant War conflicts, which later saw the involvement of reawakened Forerunner Prometheans led by the Didact. This conflict would be fought as late as mid-2558. In addition to these new threats, the ongoing Insurrection that had stalemated as a result of the prolonged struggle for survival against the Covenant onslaught began to resurface as humanity's fractured and decimated domain across the galaxy struggled to unify under the resurgent Unified Earth Government. In spite of the diplomatic efforts of Fleet Admiral Terrence Hood to rebuild and unite Earth's remaining colonies, many such worlds in the far reaches of space have pledged their loyalty to various Insurrectionist factions in their disillusionment of the UNSC, accusing it of having abandoned them in the War. Some movements such as the highly militant New Colonial Alliance have collaborated with various Covenant remnants in weapons smuggling and terrorist attacks against the UNSC, necessitating a heightened military response against this new Insurrection as various Covenant factions continue to bolster their ranks. A damaged human civilian freighter, Horn of Plenty, suffers a slipspace drive malfunction from Harvest to Madrigal, forcing the unmanned freighter to exit back into normal space. A Covenant vessel, Minor Transgression, comes into contact after hours of the freighter's isolation. The Covenant vessel targets the freighter, and a Jackal boarding crew enter. The Covenant launch a full-scale assault on Harvest, glassing the planet. Afterward, the Minister of Fortitude, Vice-Minister of Tranquility, and the Philologist become the High Prophets of Truth, Regret, and Mercy, and declare war on humanity. Shortly after the attack on Harvest, the colonies of Green Hills and Second Base are glassed. The Battle of Chi Ceti takes place, marking the first real ship-to-ship engagement between humanity and the Covenant. It is also the first uncontested human victory. The Battle of Alpha Corvi II takes place; the Covenant launch a major assault on the city of Jamshid. While the UNSC Navy engages the Covenant in orbit, the Spartan Blue Team is deployed to discreetly aid the UNSC Marine Corps ahead of a major counterattack. An alliance with the United Rebel Front prevents the Covenant's acquisition of Forerunner artifacts, but the UNSC is unable to stop the invasion. The UNSC ultimately retreats, and the entire rebel force is annihilated when they are refused evacuation. Battle of Harvest. The UNSC and Covenant meet in a fleet-action for the first time; though only one Covenant ship faces a UNSC battle-group of 40, it is a rare, exceptionally powerful super-destroyer. The battle is a high-priced victory for the UNSC, costing the UNSC 13 ships—about one third of the battlegroup that was assembled to face the threat. The Covenant would return to Harvest later in the year, and the battle for the planet and its surrounding systems, dubbed by the UNSC as the Harvest Campaign, would last for the next five years. Battle of Circinius IV. The Covenant attacked the UNSC Corbulo Academy of Military Science on Circinius IV, catching the cadets there off guard and sparking a massive ground battle for control of the Academy. 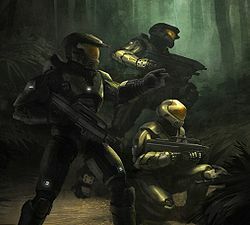 The Spartan Blue Team was deployed to fight the Covenant soldiers and to evacuate the trainees who were forced to engage the enemy in close-quater combat. The battle resulted in the near-complete extermination of the planet's population, including those of the Corbulo Academy save for the survivors of Hastati Squad. Battle of Alpha Aurigae. Another ship-to-ship battle, where the UNSC outnumber the Covenant almost 10-1, but lost a third of the ships. This was one of the rare naval "victories" for the UNSC, won because of their numerical superiority over the Covenant in that battle. Battle of XI Boötis A, the UNSC fleet of 70 warships destroy 8 enemy vessels, losing 30 of their own in the process. Madrigal is glassed by The Covenant. Battle of Groombridge-1830, 11 UNSC Destroyers are lost in attempt to defeat a Covenant fleet of 3 warships; the battle ends in a costly victory in which the UNSC learns from the interrogation of a Covenant prisoner of the reason for their intended extermination. The UNSC finally manages to retake Harvest, ending the five-year long Harvest Campaign in a UNSC victory. Battle of Arcadia, UNSC victory; the humans successfully repel the Covenant after a costly holding action. Battle of the Etran Harborage, UNSC victory; human forces eliminate a Forerunner fleet reactivated by the Covenant; the UNSC Spirit of Fire is drifting through unknown space and eventually declared lost with all hands. Kurt-051 is kidnapped by Section III of ONI to train the classified SPARTAN-IIIs, in a need for more supersoldiers to fight the Covenant. Battle of Vodin, Covenant attack the UNSC colony, but the planet is not destroyed; Spartan-II soldier Randall-037 is listed as MIA. In an effort to better protect the remaining human worlds, the UNSC implements the Cole Protocol. The Covenant destroys the UNSC colony world of Jericho VII in the Battle of Jericho VII. In the course of four short years, UNSC forces have been hammered, despite excellent leadership and tactical brilliance. It is simply a matter of being outgunned; Covenant kill ratios tend to top three to one in ship-to-ship combat. By 2535, virtually all of the Outer Colony worlds have been glassed by the Covenant. Covenant forces begin to swarm into the Inner Colonies. For several years the war falls into a pattern: humans win isolated battles, typically during ground operations, but at a horrible cost and rarely without the Spartans' assistance. In space combat, the humans are losing at a precipitous rate, and one by one, the colonies fall. Discovery of Covenant Manufacturing Plant K7-49 at the Battle of New Harmony. Battle of New Constantinople, UNSC victory. Battle of Leonis Minoris, Covenant destroys two of the three colonies in the Leonis Minoris system. Siege of the Atlas Moons was a rare victory for the UNSC, as victories in space-based fighting were uncommon for the UNSC Fleet. Operation: PROMETHEUS: UNSC victory. SPARTAN-III Alpha Company is killed by Covenant forces. Battle of Kholo, Covenant forces glass the colony of Kholo. Battle for Alluvion, Covenant victory, Alluvion is glassed. On March 6 the Battle of 18 Scorpii takes place. In the battle prior-unknown Independent/Insurrectionist human forces assist three UNSC destroyers in defeating a Covenant CPV destroyer. Vice Admiral Preston J. Cole is presumed to have made his last stand at the Battle of Psi Serpentis on April 18. Over 300 Covenant ships destroyed in the battle. As of this time, it is humanity's greatest single victory in the war. Battle of Miridem, the SPARTAN-II Sheila-065 is killed while protecting Dr. Catherine Halsey on Miridem. Halsey is subsequently captured by Covenant forces, and is placed on board a Covenant assault carrier in the Third Fleet of Glorious Consequence. Operation: WARM BLANKET, following Halsey's capture by the Covenant, the Office of Naval Intelligence initiates an operation to rescue her with the assistance of five SPARTAN-IIs. The operation is a success, and Halsey is rescued, at the cost of two of the Spartans. Battle of Draco III. Covenant kill all UNSC ground forces and captured thousands of civilians. Later a SPARTAN squad arrive and kill all Covenant forces only to find that the civilians were killed by ravenous, raging Grunts and Jackals. Operation: TORPEDO: UNSC victory. All participating SPARTAN IIIs, with the exception of Tom-B292 and Lucy-B091 of SPARTAN-III Beta Company are killed by Covenant forces. Battle of Actium: Covenant victory. The 53rd Armored Division is wiped out in a nuclear attack aimed at halting the Covenant offensive on the UNSC colony of Actium; Although casualties are high, the Covenant ultimately glass the planet. Sargasso is attacked by the Covenant. This engagement marks the first appearance of the Type-46 Infantry Support Vehicle. Battle of New Llanelli: Covenant victory, New Llanelli is glassed. The UNSC colony of Skopje is destroyed by the Covenant. Battle of Meridian, UNSC victory; Covenant armada is repelled. Siege of Paris IV, Covenant victory. Fall of Arcadia, Covenant victory, Arcadia is glassed. Battle of Meridian resumes, Covenant victory; The Covenant glass the colony as the UNSC retreats, recovering a Forerunner Luminary that contains to the coordinates to "Erde-Tyrene". Unbeknownst to them, it is the human homeworld Earth. Battle of Fumirole. Thom-A293 is killed and Kat-B320 loses her arm. Battle of Sigma Octanus IV. The single greatest UNSC victory since Harvest. However, the Covenant gain what they seek: the location of Installation 04. They also discover the human presence on Reach. The Covenant discover Reach, and send in an advance invasion force, beginning the prolonged Battle of Reach. Battle of Criterion. Gabriel Thorne single-handedly saved his entire platoon. Battle of Tribute. Along with other colonies in the Epsilon Eridani System, Tribute is invaded by Covenant forces. The colony is not glassed instantly, but remains under siege by Covenant forces for some time. Raid on Verge. A Covenant Beacon transmitting helium-3 for ships blockading Tribute is destroyed by Team Black. Battle of Line Installation 1-4. A UNSC ship on a covert mission, as well as a Covenant Assault Carrier, crash on a remote moon with a Forerunner relic. In the ensuing engagement, the surviving UNSC forces side with the Covenant against the installation's defense systems. The Fall of Reach ends. On August 30, 314 Covenant ships destroy over 130 UNSC ships and 20 ODPs for the loss of at least two-thirds of their fleet. It is a major Covenant victory: Reach is the last major stronghold before Sol. The UNSC Pillar of Autumn escapes. Installation 04 begins to disintegrate, signalling a turning point in the Human-Covenant War. Battle of New Jerusalem. Following an attack on the UNSC colony of New Jerusalem, the 26th Marine Expeditionary Force is sent to reinforce the UNSC forces already present. The colony is eventually lost to the Covenant and the survivors fall back to Earth. Battle of Installation 04. The Pillar of Autumn engages the Covenant Fleet of Particular Justice at Halo Installation 04. After four days the battle degenerates into a four-way melee as the Flood organisms are released and Forerunner constructs, Sentinels seek to contain the outbreak. The crew of the Pillar of Autumn are instrumental in preventing the Flood from escaping and the installation from firing by destroying the installation. There are only a handful of survivors. Skirmish over Threshold. UNSC survivors from the Battle of Installation 04 rally in orbit over Threshold. Using their limited resources to the fullest they manage to capture the Covenant vessel Ascendant Justice and use it to escape. Raid of Reach. John-117 and some of the survivors of the Battle of Installation 04 raid Reach to rescue a SPARTAN-II team trapped on Reach by a Covenant fleet. They rescue the Spartan squad leaving a great deal of damage to the Covenant fleet ships and the ground forces. Massacre at Eridanus Secundus. It was a minor event in the Human-Covenant War that ultimately resulted in the destruction Eridanus rebels by the Covenant. It is most notable for the involvement of the Gettysburg-Ascendant Justice and Dr. Halsey's kidnapping of Kelly-087. Operation: FIRST STRIKE. Five SPARTAN-II super soldiers route and destroy a fleet of 500 Covenant warships preparing to jump to Earth. This is accomplished through the destruction of the massive mobile space station Unyielding Hierophant. This is the single greatest victory, for the humans during the entire war and the single greatest loss to the Covenant. Battle of Earth. 15 Covenant ships assault Earth, defended by the UNSC Home Fleet and 300 ODPs. The Covenant were not expecting the heavy human presence, as well as their new orbital MAC defenses, and are completely destroyed save for the Solemn Penance- the High Prophet of Regret's personal assault carrier, and the Pious Inquisitor. However, a fleet of Covenant capital ships appears soon after, prolonging the battle. Battle of Installation 05. The Solemn Penance arrives at Installation 05, being pursued by four small UNSC warships. Only one, the UNSC In Amber Clad, arrives in time to participate in the battle. The Prophet of Regret is assassinated by John-117. The Great Schism begins. Covenant forces are thoroughly divided between the Sangheili and the Jiralhanae. Every race in the Covenant takes sides. The Prophet of Mercy is later killed by a Flood Pod infector. Once again, the installation is prevented from firing and the Flood appear to take control of the installation and High Charity. Onyx Conflict. The destruction of Installation 04 wakes dormant Forerunner installations, including the Sentinels on Onyx which then threaten the UNSC base there. The SPARTAN-IIs of Blue Team fight their way off of Earth and commandeer a Covenant Destroyer, the Bloodied Spirit, to relieve Onyx. Covenant and UNSC ships converge on Onyx but ultimately all are destroyed except for the UNSC Dusk. UNSC survivors retreat within the Onyx Shield World. The destruction of Joyous Exultation. A Sangheili-led Covenant fleet led by Imperial Admiral Xytan 'Jar Wattinree assembles to besiege the Covenant forces on the colony world of Joyous Exultation. During this, the Covenant accidentally trigger a captured NOVA bomb recovered from Reach, annihilating the fleet, the entire colony and shattering its moon Malhiem. The Battle of Earth continues. The Covenant, led by the Prophet of Truth, arrive at Earth in force, to reinforce the Covenant forces already present. During the following week, Marines, with help of the Sangheili, pushes back the Covenant invaders. All Covenant vessels are destroyed over the Ark by the Sangheili Fleet of Retribution. The final Covenant religious leader, the Prophet of Truth, is executed by the Arbiter with help from the Flood. The Master Chief stops the Ark from firing the Halo Rings. The flood controlled High Charity is destroyed by the Master Chief after he blasts the city's main reactors causing them to go critical. The Battle of Installation 08. Thel 'Vadam, John-117 and Johnson battle to the control room that's on Installation 08. Guilty Spark runs rampant, killing Johnson before being destroyed. Installation 08’s Sentinels turned on John-117 and Thel 'Vadam. The unfinished Installation 04 is activated, damaging the Ark and destroying the entire Flood infestation including the Gravemind. These final events ended The Human-Covenant War. However, the Dawn is torn in half while entering the portal home, sending 'Vadam to Earth, but leaving John and Cortana lost in space. The Arbiter returns to Earth in the front half of Forward Unto Dawn, crashing into the Indian Ocean. He is safely cut out of the wreckage by UNSC forces. Fleet Admiral Hood meets with Arbiter Thel 'Vadam on Sanghelios. They agree to a ceasefire between humanity and the Sangheili loyal to Vadam. While the fighting finished in December and a ceasefire was agreed upon in February, hostilities are not ceased officially until March, when the UNSC-Sangheili Treaty of 2552 is formally ratified. The UNSC erect a monument on a hillside near the Ark's gateway to commemorate those who died during the war, particularly during the Battle on Installation 00. Two of the most prominent figures listed on the memorial are John-117 and Dr. Catherine Halsey, though both remain alive. Thel 'Vadam and his retinue depart for Sanghelios. The "Great War", a name for the war used by Petra Janecek, was originally used for the First World War prior to the outbreak of the Second World War in 1939. Avery Johnson was the only human to witness both the beginning and end of the Human-Covenant War, as he was present when Harvest was attacked and saw the Prophet of Truth's death, which signified the end of the war. He was also the first human to kill a member of the Covenant. Admiral Preston Cole questioned the Covenant's apparent difficulty of finding Earth; he pointed out that they could have simply picked up human radio signals and triangulated the source. Cole theorized that the Covenant's systematic destruction of human colonies before assaulting Earth may have been due to an internal scheme within the upper tiers of the Covenant hierarchy that prevented Earth from being targeted sooner; that the destruction of the Outer Colonies before Earth was part of a religious ritual; or that the Covenant were not particularly interested in humanity's homeworld strategically, but for some other, unknown reason. Cole suspected that members of the Covenant military may not have been informed of the particulars of these underlying schemes; in order to prevent hypothetical "rogue elements" within the Covenant military from attacking Earth without authorization from the Covenant leadership, Cole recommended ONI to obfuscate human radio signals in slipspace. Cole's speculations appear to have been at least partially correct; the Prophet of Truth had a far-reaching plan to increase his personal power, which involved keeping the other Hierarchs and most of the Covenant ignorant of key information, including the location of the human homeworld, until the optimal moment to strike Earth. Truth's plans were partially compromised when the Prophet of Regret discovered the location of the Ark Portal on his own and proceeded to attack Earth, unaware of the human presence. Despite Cole's theories, however, the possibility of triangulating Earth's position from radio signals does not appear to have occurred to the Hierarchs, as evidenced by Truth's more convoluted plan to have Kig-Yar led by Reth acquire navigation data leading to Earth from the Rubble, and the fact that Truth did not discover Earth's location until 2552. The length of the Human-Covenant War (28 years) is a reference to the number seven: 28/4= 7. ↑ Allied with UNSC/Fleet of Retribution only during the 1st half of the Battle of Installation 04 (UNSC only), Battle of Installation 05 and Battle of the Ark. Elsewhere and excluding these battles, Forerunner constructs were hostile to the UNSC/Fleet of Retribution' (including during the 2nd half of the Battle of installation 04 (UNSC only), Battle of the Etran Harborage (UNSC only), Battle of Onyx (UNSC only) and the Raid on Installation 08). However, Forerunner constructs were hostile to both Flood and Covenant forces throughout the entire war. ↑ While the deciding battle of the war was fought on December 11, 2552, a formal ceasefire was not agreed upon until February 2553. The official cessation of hostilities was declared on March 3, 2553. ↑ The name "Covenant War" is most often used by media from 343 Industries. However, the less common "Human-Covenant War" is more descriptive and is therefore used by Halopedia. ↑ Halo: Evolutions - Essential Tales of the Halo Universe, "The Return"
↑ 78.0 78.1 78.2 78.3 78.4 Halo Waypoint, "Ten Twenty"